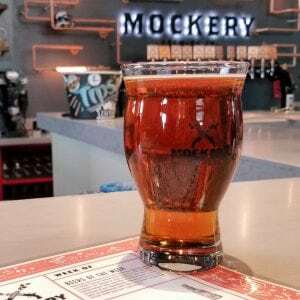 Mockery Brewing is the epitome of the RiNo Brewery scene. 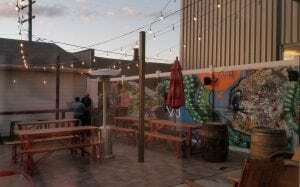 Tucked on the corner of 35th Street and Delgany Street – it’s just a stone’s throw from the Platte River and the 38th/Blake Street Station. It’s fun, hip, unique, and serves up one heck of a brew! After hearing the buzz surrounding Mockery Brewing for a hot minute, I knew it would fast become a favorite. So, I grabbed a fellow beer loving friend and we made our way there to sample some beers and kick off a Saturday Brewventure in RiNo! 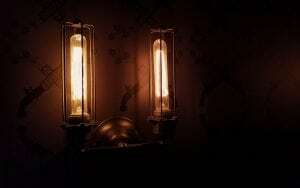 The ambiance here is FANTASTIC and I’m totally digging it! While the inside space is on the smaller side – it’s very well done. Details throughout the space really bring it all together. From Edison lighting, the copper piping behind the taps, poured concrete table tops, heck even the bathrooms are a sight to see. The production area is adjacent to the taproom – allowing you a front row seat to the brewing action. Mockery Brewing even has a game room featuring various arcade style games off the LARGE dog friendly patio! The beertenders were super friendly, attentive, and beyond helpful in talking to us about the various brews and a bit about the brewery. Being seated at the bar as we were, allows for excellent conversation with the beertenders and some personal insight into the various brews being poured up. You can tell that they truly view their thirsty patrons as more than just customers; they are friends. They also feature a fantastic assortment of events at the brewery. Whether you’re into crafting, food pairings, or just various small batch brews – follow them on Facebook to keep up with their happenings. 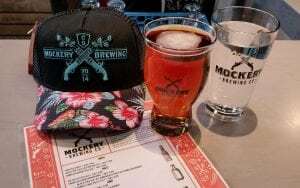 Mockery Brewing’s website sums it up just right: “For beer drinkers looking for creative and delicious brews, Mockery Brewing is the innovative producer of damn good beers that break the rules in all the right places.” Everything we tried was solid! I sipped on Parts Unknown, a tangerine mixed culture sour ale, and Grenade, a tepache-inspired blonde ale with jalapeno and serrano peppers. Both were completely delicious! Grenade was just the right balance of sweet and spicy with no residual murkiness. My fellow brewery goer got Black Forest Cake, a milk stout, and Schizophrenic Narcoleptic, a vanilla bourbon barrel-aged imperial coffee stout. Naturally I stole a sip of each. Both were incredibly tasty with great depth of flavor. Loved the sweet boozy notes found in Schizophrenic Narcoleptic. The unique combinations and wonderful flavors really surprised me. ALL the swag! Every brewery features a variety of merchandise, so its fans can showcase their favorites. 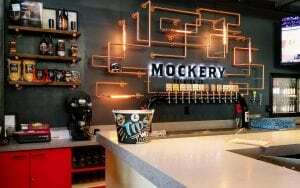 Mockery Brewery is no exception. To the right of the entrance there’s a glass case showing the various shirts, hats, tanks, glassware, and more. I’m not ashamed to admit that I left with the cutest hat with a flowered bill. Super adorbs! Icing on the cake for Mockery Brewing? They’re featured in both the Pub Pass (www.getpubpass.com/den/) and The House that Beer Built (www.habitatbeerbuild.org)! Both passports offer either a free pint or a buy one, get one deal; while also supporting great causes. Excellent companions to have for the avid brewery goer. 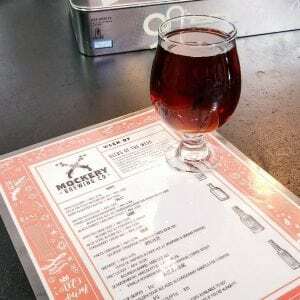 Mockery Brewing is a wonderful gem in the RiNo neighborhood and a true jewel in the Denver-Metro brewery scene. Definitely a brewery that every beer lover should make their way to.